World Series Baseball is a 1994 baseball game by Sega and BlueSky Software released for the Sega Mega Drive in the US. It was followed by World Series Baseball '95. 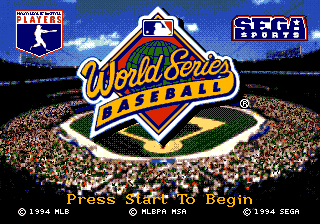 A World Series Baseball game, most likely a port of this version, was once planned for release on the Sega Mega-CD. Furthermore, other than using the bog-standard control methods of earlier baseball games, World Series Baseball introduces three different levels of control for the batter and pitcher: Rookie (automatic targeting) and Veteran and All-Star (where instead of physically moving around you move a target around to show where to bat/pitch). Main article: World Series Baseball (Mega Drive)/Magazine articles.